My desire to trust God is an everyday decision. It’s not that I decided to trust God and then never had to struggle with that ever again. It’s a daily choice for me. Everyone has days when their doubts and lack of trust in God rise up and drown them. 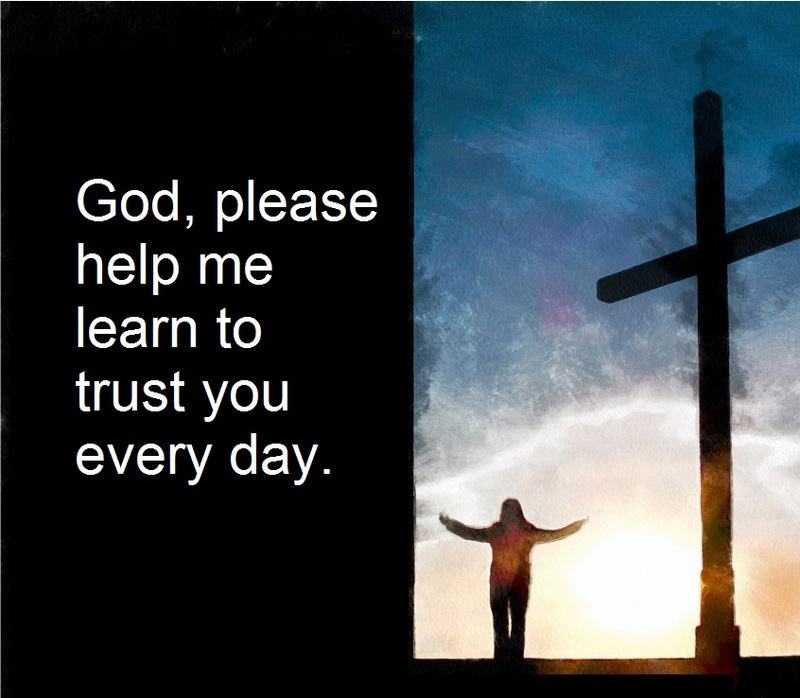 I sometimes (on very hard days) repeat out loud over and over again “I trust God, I trust God, I trust God.” It helps. It places the burden that life can be on Gods’ shoulders, and reminds me that he will show me the way. He is in charge of my life. God will move me into the position he wants me in. I just have to seek his direction and ask him how to get through, what I am going through. I am so glad that the prophets and the apostles in the Bible asked questions. They looked around and saw despair, violence, evil, lawlessness. They saw the ungodly prosper and the righteous attacked and asked God why? Look at the prophet Habakkuk. In Habakkuk 1:2, he asked: “O Lord, how long shall I cry, and You will not hear?” Have you ever felt that way? I certainly have. Look at Moses, when God called him to go back to Egypt he had huge doubts about his abilities. “Who am I that I should go to Pharaoh, and that I should bring the children of Israel out of Egypt?” He complained about his speech, implying that he was not a good speaker. “O my Lord, I am not eloquent, neither before nor since You have spoken to Your servant, but I am slow of speech and slow on tongue”. See the apostle Thomas doubting that Jesus was resurrected. He was asking for proof of his wounds. “Unless I see in his hands the print of the nails, and put my finger into the print of the nails, and put my hand into his side, I will not believe.” I am so thankful he did. I am glad he was a doubting Thomas so that we may know the truth. I am so glad they had doubts and asked questions. They were prophets, and I am not. They were judges, and I am not. They were apostles, and I am not. I am so glad it’s okay to ask questions because I am such a curious person. I am forever asking WHY? I have to admit that my husband gets a little tired of my questions sometimes, but I believe God does not. After all, he created me like this. I seem always to want to know the when, where, how and why of something. You can thank all the journalism classes I had in college for that! When my brain starts to hurt, I remind myself yet again. I TRUST GOD, I TRUST, GOD, I TRUST GOD! I will never understand everything. I will never have all my questions answered. Well, not until I get to heaven anyway, and who knows I might not even care once I arrive in paradise. After all, I will be in heaven, YA HOO! I doubt the first thing I will want to do is ask a lot of questions. My first and foremost desire when I arrive is to sit in Gods lap and have him permanently wipe away all my tears. Is there something in your life that keeps you from trusting God? What is it? Now that you have identified the reason why you don’t trust God, talk it over with someone you trust. If you don’t have anyone go to a Bible Teaching Church and ask for a Pastor of the day. Can you imagine the kind of love mentioned in John 3: 16? The first statement “For God so loved the world,” is a declaration that God indeed loves us. In today’s climate, you can find a lot of hate speech. People who claim that God does not love that group or another group. However, this scripture is clear. God does indeed love us all. When you speak about the world, you are speaking about everyone who resides in it. “That he gave his only begotten son” is a statement that truly humbles me. Jesus Christ was and is Gods only son, conceived by a human woman but fathered by the spirit of God himself. In Luke 1:35 an angel tells Mary, the mother of Jesus, “The Holy Spirit will come upon you, and the power of the Highest will overshadow you; therefore, also, that Holy One who is to be born will be called the Son of God.” Jesus is, Gods child in human form and he gave him up to die on the cross for YOU! Maybe you believe this statement, but wonder if he gave his son to die for someone else. Maybe someone better than you or kinder than you or not as sinful or as weak as you. NO, Not True! He gave his only son, one he loved greatly for YOU. It’s personal; it’s a laser light shining on you. Let’s dissect this for a moment. I can share with you that I could not nor would ever do that. I have two sons, and I would never give up either one of them for anyone else’s life or even their salvation. Can you imagine that? I cannot understand allowing your child to die so that others may reside in heaven someday. But, I am not God. I am human, and God is not. Thank goodness no one has to rely on me for their salvation. You have only to rely on God and his sacrifice of his son so that you can be saved. Saved for Heaven. Saved to walk and talk with God on a daily basis. To be with him moment by moment, second by second throughout your life. Trust me in this; he is great company! Maybe you have wondered “Did God truly love his son?” Matthew 3:17 answers that question. “This is my beloved Son, in whom I am well pleased.” In this scripture, God himself speaks and declares his son, Beloved! If you search Webster’s dictionary for the word beloved, the definition is, dearly loved and dear to the heart. Some synonyms listed are, cherished, precious, favorite. He indeed did love his son. He was precious to him, cherished above all. He was also proud of him. He states in his own voice “In whom I am well pleased!” He not only loved him but was proud of him. There are a number of years in my life that I would love to erase from my memory. 2016 was such a year. I had a year long struggle with one illness after another. Not one health issue but four different ones, one right after another. As I was writing this, I was propped up on my bed having just come home from the hospital because of a particularly evil stomach virus that ended with an ambulance ride. I confess that during this period, I had a lot of moments when I felt unloved. Have you ever been through a series of extremely painful circumstances and looked up to the sky and asked God “Are you trying to kill me?” Well, I have. So during my illness, I printed out John 3:16 with my name inserted in it and taped it up on the wall right next to my bed, so that every morning when I woke up and every night when I went to sleep, there it was! A reminder of what God did so that I could spend eternity with him. He must really love me if he wants to spend that much time with me. Do it now for yourself. Insert your name. It’s for you, salvation for you. Love for a lifetime and beyond. Believe in the one God sent and YOU WILL NOT PERISH! YOU WILL HAVE ETERNAL LIFE! Do you believe in the promise of John 3:16? If not, why? What is holding you back? Do you feel unworthy of the gift that God is offering you? STOP! We are all unworthy and God offers this promise unconditionally. This scripture instructs us that we are all born with a longing in our heart. A longing, a hole in our heart that only Jesus can fill. As human beings, we often try to fill that space with lesser gods. Things or activities that might satisfy for a brief moment. Some of us find comfort in food, while others use alcohol or drugs to try to fill that void and numb that pain. Let’s not forget materialism, that constant need to shop and find that little high when we purchase something. We stuff other things and sometimes even people in that place that is only designed for one. THE ONE. That longing in your soul will never be satisfied by anyone or anything other than Jesus. When you ask Jesus to be your Lord, he satisfies the longing in your soul and fills it with goodness. When you are aching for something but you don’t know what, it is a relationship and communion with Christ. Other things don’t gratify; they are only empty calories. Only Christ can satisfy.He is enough. He fills that cold and lonely place in your heart to overflowing. I can make a very long list of good things that come from a relationship with Jesus, but let us just focus on a few. One of the most crucial “good things” that come from Jesus, is peace. Philippians 4:7 explicitly states that peace comes through Christ. “And the peace of God, which surpasses all understanding, will guard your hearts and minds through Christ Jesus.” In this world, peace is a rare thing. It can only come from Christ. You cannot drink it, eat it, buy it, create it, or even manufacture it in a lab. Peace is a by product of giving your life to Christ. When you are complete with the Holy Spirit, you can rely on it for peace. That is pure goodness! What about unconditional love? Do you think you could love others unconditionally without the benefit of Jesus? No way! We are, after all, HUMAN! In 2 Timothy 1:7, the Bible assures you the gift of love. “For God did not give you a spirit of fear, but of power, love and a sound mind.” Love comes from knowing Christ. Christ can fill that ache, that longing in your heart with his love and his love is enough. All the goodness that Christ fills your longing soul with, is enough. Jesus is enough. Count on him for every good thing. Do you feel that longing or ache in your soul? What “lesser gods” do you fill the ache in your heart with other than Christ? What do you need to do in order to fill that hole in your heart with Christ and Christ alone? Is a sense of peace hard for you? How could you count more on Jesus to help you with that? Is your love of others worn out? How can you rely on Jesus and not yourself for love to flow from you? What other “good things” have come from Christ directly to you? Name some we have not mentioned. Prayer: Christ, you alone are enough to fill the emptiness in my heart. Help me to understand that clearly. 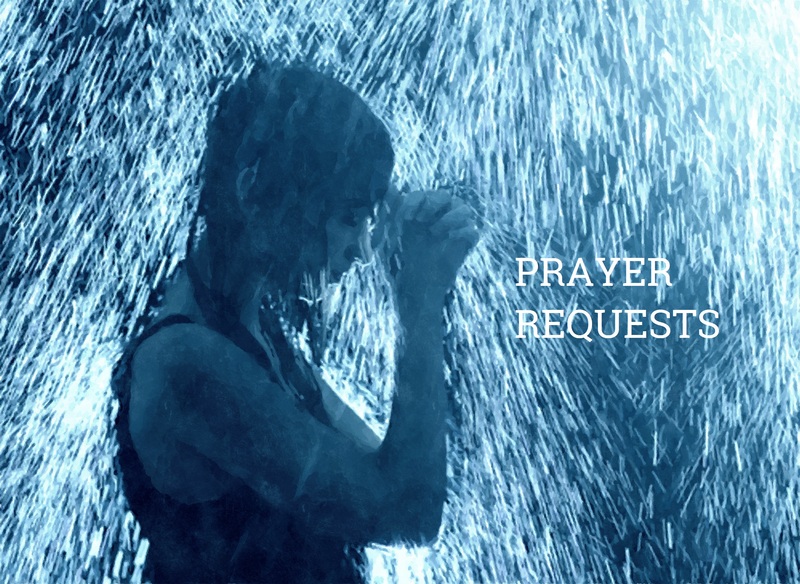 Please help me realize that I can have access to your goodness just by knowing you personally. 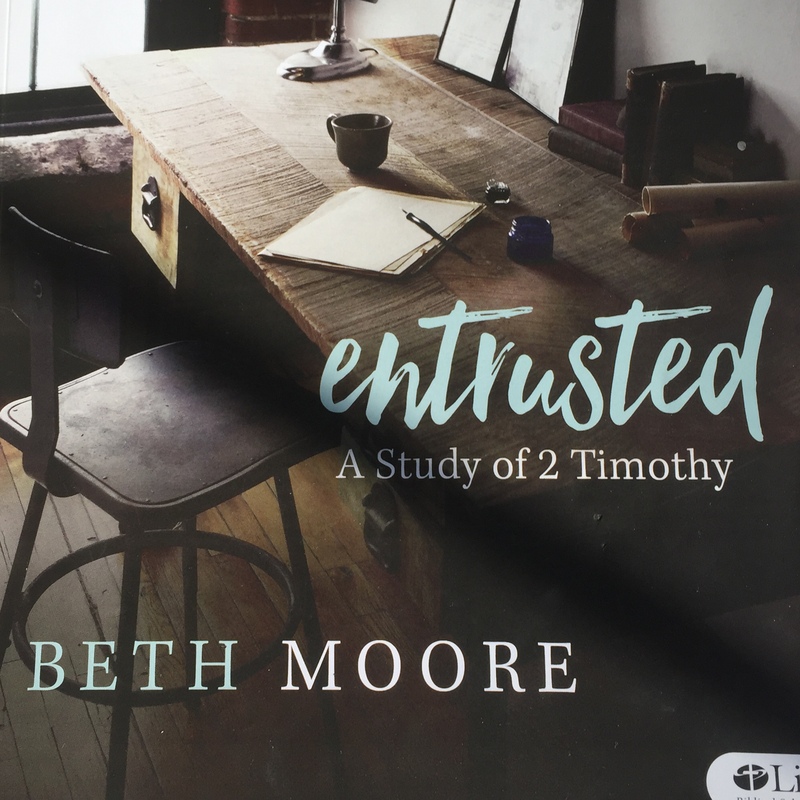 For further study on this topic, please read "Entrusted" by Beth Moore.